All items marked in RED are required fields and must be populated before the Invoice can be saved. (18) Enter the Bill Service To customer code. TeleTracker Online will automatically populate this field with the Sold To customer code identified in the General TAB of the invoice. However, you may change this code as desired. To perform a lookup and choose from existing customers, click on the lookup button to the right of the Customer Code field, highlight your choice, and either double-click or hit the <Enter> key. You may also add a new Customers Master File directly from this screen by clicking on the New icon button in the upper left-hand corner of the screen and following the prompts within TeleTracker Online. (19) The next three (3) fields, Service Provider, Service Plan, and Term of Agreement will all be populated by performing a lookup. To begin, click on the tall, vertical lookup button to the right of these three (3) fields and locate the desired Service Provider. Once you have located the desired Service Provider, expand the folder by clicking the plus (+) sign on the left. This will display the available Service Plans. Locate the desired plan and expand the folder by clicking the plus (+) sign on the left. This will display the available term period(s) for the specified Service Plan. Double-click the term period. TeleTracker Online will automatically populate the fields with your corresponding choice. (20) **When applicable, enter the Service Provider's approval code in the Approval Code field. (21) **When applicable, enter the telephone number assigned to the Activated Item in the Cellular Phone # field. (22) Enter the desired date in the Activation Date field. TeleTracker Online will automatically populate this field with the current date. You may change this date as desired by clicking on the arrow to the right of the Activation Date field and utilizing the built-in calendar. (23) When applicable, enter the amount of any deposits from the provider in the Provider Deposit and/or the Other Deposits field. (24) Enter the Activation Type. Click the arrow to the right of the Activation Type to select from the list of available Activation Types. 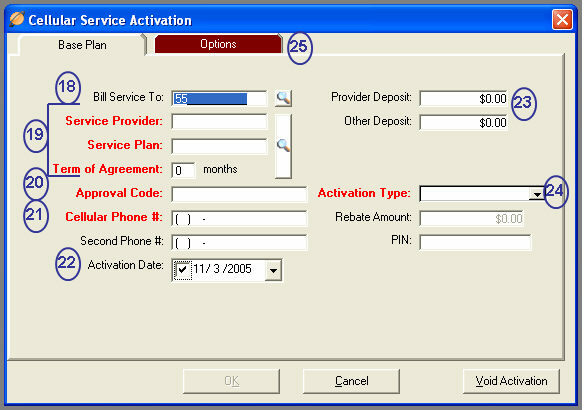 (25) Once the Base Plan TAB of the activation has been completed, click on the Options TAB. A list of the plan’s available options will be displayed according to the parameters defined in the Service Providers Master Files. With the exception of mandatory options, you may select and/or de-select options as desired by simply clicking on each option’s corresponding check box. All items marked with ** can be set with a default within the TeleTracker Online Preferences. Creating these defaults will aid in the speed of the sale and greatly decrease the manual input performed by the salesperson. Click the OK button to return to the invoice. When appropriate, repeat the steps in the Cellular Service Activation Window to activate another item.